Defense/diplomacy expert General Victor Corpus and geopolitics analyst former Education Undersecretary Antonio "Butch" Valdes on July 11 at non-partisan “Pandesal Forum” of 78-year-old Kamuning Bakery Cafe in Quezon City said President Rody R. Duterte's wise, nationalist and pragmatic handling of the July 12, 2016 Arbitral Tribunal decision victory of the Philippines "has brought about stability to Asia, lessening of regional tensions, promoted a win-win strategy benefiting both the Philippines and China, upholding our pursuit of a truly independent foreign policy". General Corpus said the Philippines had basically two approaches to handle the arbitrary case, the win-lose option or the win-win option. He explained that the win-lose approach calls for pushing the Philippines' total win at the arbitral tribunal and to force the non-participant party China into a total loss position, while Duterte's successful win-win strategy now allows both countries not to surrender or compromise any sovereignty rights and also not endlessly quarrelling, but both countries agreeing to disagree while continuously negotiating, improving the two countries’ ancient bilateral diplomatic and economic relations. Corpus said President Duterte’s independent foreign policy reform still asserts the Philippines’ sovereignty claims in the Spratlys vis-à-vis those of the rival claims of China, Malaysia, Taiwan, Vietnam and others, but these territorial disputes shouldn’t sour the Philippines’ important diplomatic and economic relations with all these Asean and Asian neighbors. On the question on how best to respond to China’s constructions in the disputed Spratlys, General Corpus said that he believes the best Philippine response is the Duterte administration’s current policy of maintaining the status quo in the region: the Philippines continues to occupy and build on islets we hold on to, while China and other Asian governments can do so in their respective areas that they now physically hold on to, negotiating for demilitarization of the region and for a Code of Conduct for the region. Valdes said that President Rody R. Duterte’s independent foreign policy has stabilized Asia, that peace isn’t just the absence of war and that the Philippines’ new “win-win” approach to diplomacy is bringing more economic development benefits to the country and to the whole region. General Victor Corpus also added that President Duterte’s adroit handling of the Arbitral Tribunal case victory and his high-level statesmanship helped “prevent the possibility of war breaking out in this region”, because Duterte has lessened the possibility of war and of the Philippines becoming a target country in case of superpower rivalry between our military treaty ally U.S.A. and China. Corpus explained that he Duterte is correct in analyzing that China is willing to go to war for the disputed Spratlys and has built port facilities in the disputed islets because it doesn’t want the strategic Straits of Malacca to be blockaded by any foreign country since that area is where much of China’s global trade and imported oil pass. Corpus also pointed out that China’s government has built up its defense capabilities in this region, in order to safeguard against or block any nuclear and other military strikes against its economically vital coastal cities. General Corpus said President Duterte’s “successful, nationalistic and win-win diplomacy should be supported by all sectors of our Philippine society”. He said that the Philippines’ independent foreign policy should be guided only by what is beneficial for the national interests and sovereignty of the country, not to be beholden to or dictated upon any big power. Both Corpus and Valdes said Duterte’s independent foreign policy has resulted in the Philippines becoming now a friend and trading partner of all the world’s big powers USA, China and Russia, the country is no longer considered a foe or a threat to any big power. They both said that the Philippines is becoming more similar to any normal sovereign Asean or Asian country, an ally to all big powers in an equidistant manner and gaining from economic and strategic advantages from all these big powers. The non-partisan, tertulia-inspired Pandesal Forum of the 78-year-old Kamuning Bakery Café hopes to help elevate the quality of public discourse on national and international issues, current affairs, focusing more on reforms. 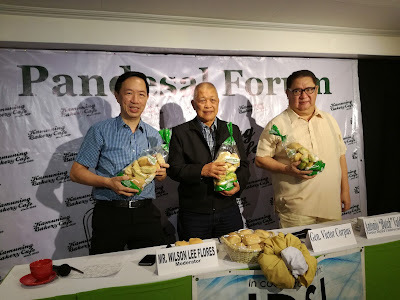 The Pandesal Forum invites newsmakers, leaders and experts to dialogue with media and intellectuals. This July 11 Pandesal Forum on the Arbitral Tribunal Case was co-organized with the Integrated Development Studies Institute (IDSI) and the Phil-BRICS Strategic Studies. What makes Turmeric so Terrific? The Wonders of Malunggay in a Capsule!